As expected, the Reserve Bank of New Zealand (RBNZ) kept its policy unchanged overnight, maintaining a relatively balanced tone overall. It acknowledged that downside risks have heightened, particularly on a global level, but retained some optimism on the outlook. Most importantly, policymakers did not provide any clear signal that the likelihood for a rate cut has risen. Considering that traders viewed a rate cut this year as a done deal, with the market-implied probability for one resting at 85% ahead of the decision, these relatively neutral signals likely came as a ‘reality check’, sending the kiwi soaring. While it was somewhat predictable that the RBNZ would refrain from outright signaling a rate cut this early, that doesn’t mean one won’t materialize later this year. Indeed, the nation’s data pulse is weakening, slowing population growth amplifies risks around consumption, and foreign developments – particularly in China – threaten the domestic outlook. Therefore, the scale seems to be tipped more towards a rate cut further down the road, which implies that the overall risks surrounding the kiwi may be skewed to the downside, though a lot will also depend on how the trade saga plays out. 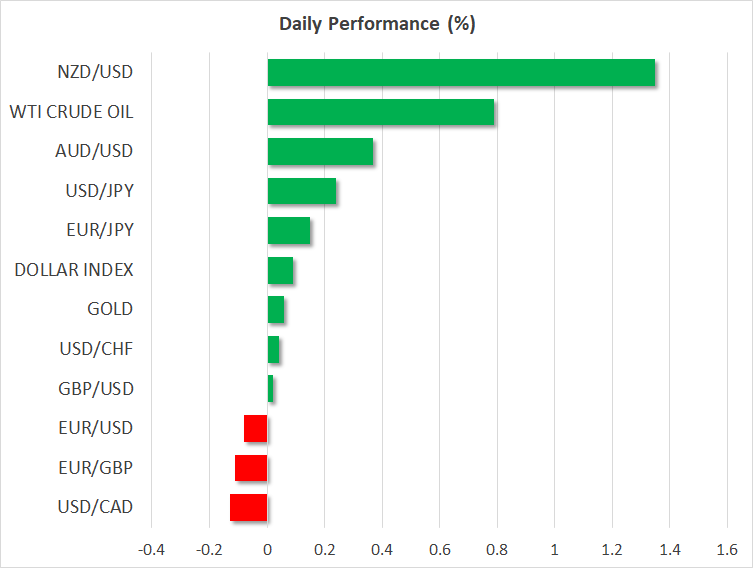 In the broader market, the overarching theme was “risk on”, with equity markets in all major regions being a sea of green and defensive currencies such as the dollar, yen, and Swiss franc surrendering ground to their G10 peers. US President Trump was the driving force behind most of these moves, with some remarks that he may extend the March 1 tariff deadline against China if a deal seems close by that point reinvigorating risk appetite. In the eyes of investors, this likely confirmed that both sides are thirsty for an accord, and simultaneously diminished the risk of a further escalation. He also noted he doesn’t expect another government shutdown, further amplifying the positive sentiment. It’s inflation day in both the UK and the US. Kicking off with Britain, the headline CPI rate for January is expected to have dipped to 1.9% in yearly terms from 2.1% previously, though that seems owed to energy effects as the core rate is forecast to have held steady at 1.9%. As for where risks may lie, the nation’s services PMI for the month implies a downside surprise may be more likely than an upside one, indicating that prices charged by service firms rose at the slowest pace since September. While a disappointment could weigh on the pound on the news, economic data will likely continue to play second fiddle to political developments in driving the British currency over the next weeks. In the US, the headline CPI is expected to have slowed to 1.5% on a yearly basis in January, from 1.9% in December. Underlying inflation is also expected to have cooled, with the core rate projected to tick down to 2.1%, from 2.2% previously. Investors will keep a close eye on these figures, as the Fed’s preferred inflation gauge – the core PCE index – will only be released in early March due to the government shutdown, which implies the CPI prints are the only inflation data in town for now. In energy markets, the weekly EIA inventory data are due at 15:30 GMT. We have three regional Fed Presidents on the schedule: Mester and Bostic will both speak at 13:50 GMT, while Harker will deliver remarks at 17:00 GMT.